I have developed a first generation devices for this project. (see doc's) These are sold as kits (see start) You can order these kits, build them and use it in your home. It is also possible to buy the PCB's separately. Since these are kits, they have to be build by you. You need some skills with soldering electronics. On the forum you can receive help from me and other users. And before you receive your kit, a "getting started" guide will be published on this site. With the mini-kit you will be able to control two light points from one location. These prices are exclusive VAT (19%) and shipment (approx 5 euro for the PCB's only and 10 euro for the whole package) within Europe. Will probably buy the mini-kit: PCB and components. Will probably buy the mini-kit: PCB only. Interested in project, will probably buy components somewhere else. Interested in project, but i do not want to buy or build anything. Please make sure you copy-paste one of these tittles, this makes it much easier for me to process. Sending the email does not mean the obligation to buy. But it will mean you would probably do so. I will contact you when we have enough people gathered to make a combined acquisition. If you decided TempleTronics is something for you, do not build devices for your whole home at once. 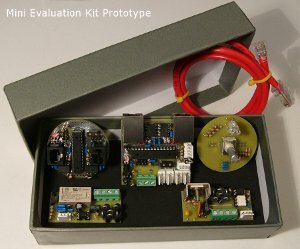 Build an evaluation kit first. These parts will be perfectly useable when you set the next step. It will give you a feeling if this is something that fits your needs, without spending to much money. As much as i would like it, i do not keep parts on store. I simply do not have the resources to do that. So at the moment you would order, i order the parts specially for you. Unfortunately, some parts can only be ordered in larger quantities, thus order are combined, as outlined above. This takes time, and you will be informed on the site about the lead times. But usually this is four to six weeks. Companies can order too. Please state in your order that it is a company order, and include your VAT identification number, full address etc. Companies pay a handling fee of 100 euro per order.